The ‘polyphony of voices’ in the letters in Afterwords represents the extent of the Woolfs’ circle of friends and acquaintances – nearly all the English writers who mattered, as well as the ‘great and the good.’ From reading these missives one is reminded just how much both Virginia and Leonard were at the heart of English letters and society, despite the open hostility they experienced from various quarters. Virginia Woolf’s massive reputation was, of course, well-established, long before her life came to an end, and in her lifetime her unique contribution has been appreciated critically. 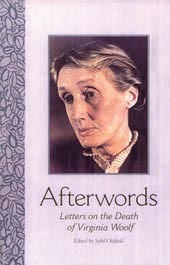 There is nothing posthumous about Woolf’s reputation, and as one correspondent wrote to Leonard, ‘she gave much which has been of value to the world, and what she gave will endure.’ After reading Orlando and The Waves, the Indian writer Tagore had already said, many years before her death, ‘Mrs Woolf is creating a tradition in literary English style,’ and on her death TS Eliot wrote that ‘for myself and others it is the end of a world.’ Despite the achievements of Bloomsbury, this group of intellectuals had from the outset been regarded by the British Establishment with great suspicion. During WWI its members and adherents had been villified as ‘pacifist shirkers.’ A few days after the coroner’s inquest, Virginia Woolf was attacked in the Sunday Times by the wife of an English Bishop, who insulted Woolf’s memory by declaring that she lacked backbone and had let the side down. This was on the Bishopess’s reading of a misreporting of Virginia’s suicide note. And just two days before The Times announced Woolf’s disappearance, a National Labour MP in a parliamentary debate denounced a certain section of British writers and artists as being like Fifth Columnists. At this time in particular, most British intellectuals were, as a matter of course and on principle, roundly despised merely for being intellectual. (Plus ça change…) But in Afterwords, the expressions of support from the number of great intellectuals and from ‘Common Readers’ alike, who all wrote in sympathy to Leonard, matter much more and are of longer-lasting importance than any silly letters to the press from Bishops’ wives or dangerous speeches made in Parliament about the ‘traitors within.’ Besides, by the time Virginia Woolf was being attacked alongside other writers and intellectuals in the House of Commons, as being one who did the work of a fifth columnist, she was already dead.